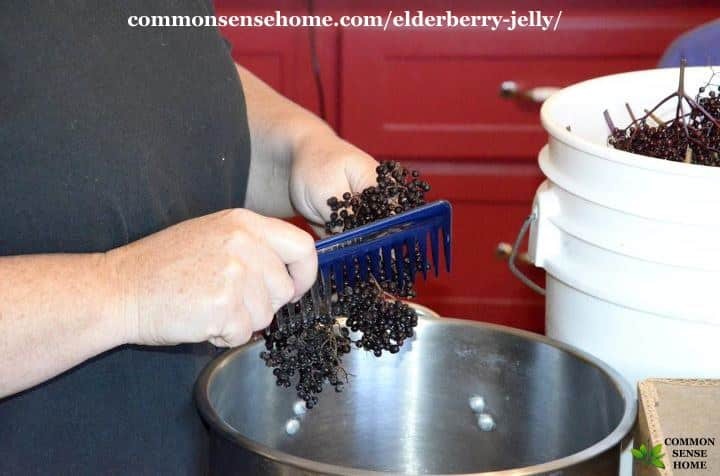 When we had a banner elderberry harvest, my friend, Tami, and I experimented with a variety of elderberry recipes, including two different types of elderberry jelly. 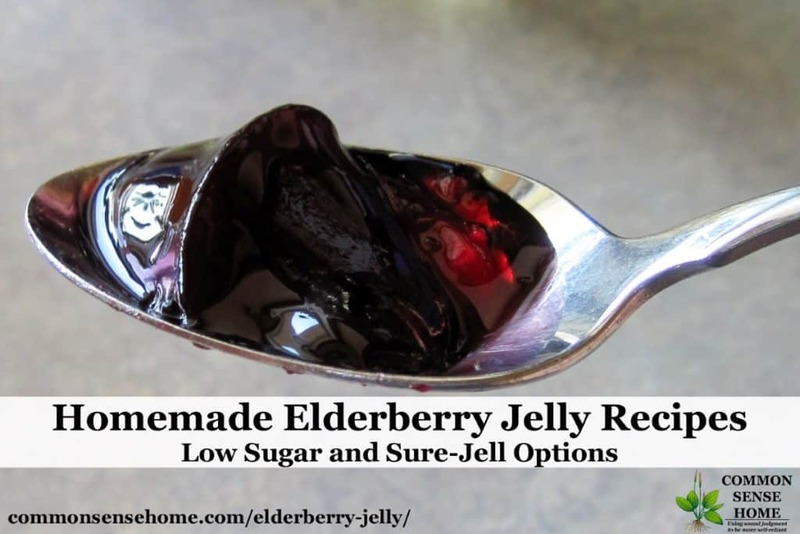 One recipe is low sugar elderberry jelly made with Pomona's Pectin, and the other is a traditional elderberry jelly made with Sure-Jell pectin. If you don't have your own elderberries, I suspect the elderberry juice concentrate sold for winemaking could be adapted for jelly making. 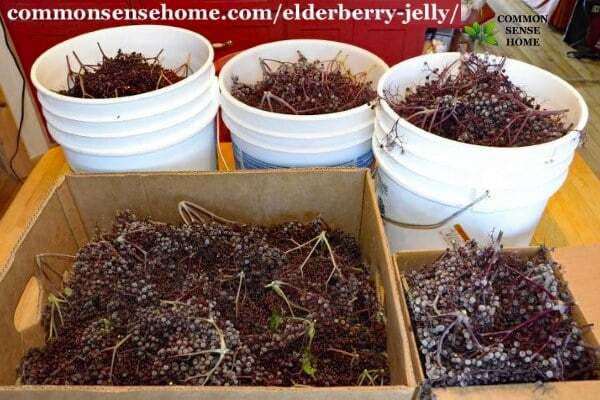 You can also buy ready-made elderberry jelly from Norm's Farms. Their jelly is made with elderberry juice and natural cane sugar, not high fructose corn syrup. Note – the elderberry cough and cold syrup recipes now have their own post, which you can find here. This recipe was based on the “Make Your Own Recipe” instructions included with the Pomona's Pectin. Calcium water is mixed up from a calcium powder that is included in the box of Pomona's Universal Pectin. Sterilize 4-5 8-ounce jars, keep hot. 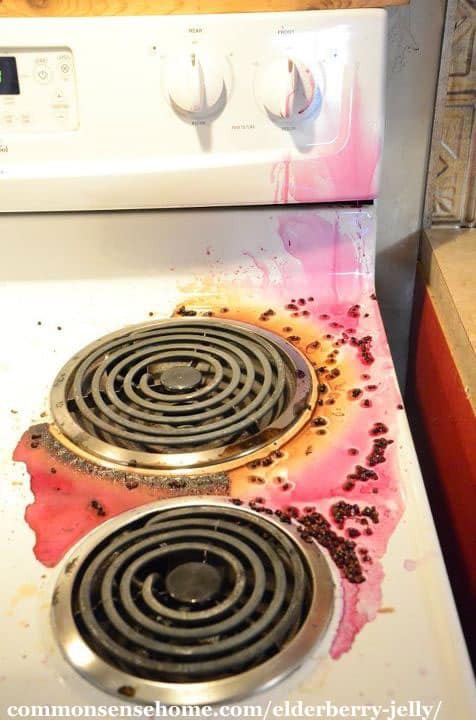 Heat lids and rings in hot water, keep warm but not boiling. Fill water bath canner and bring to boil. In a small bowl, mix together honey and pectin powder. Don't skip this step, or your pectin will clump. Set aside. 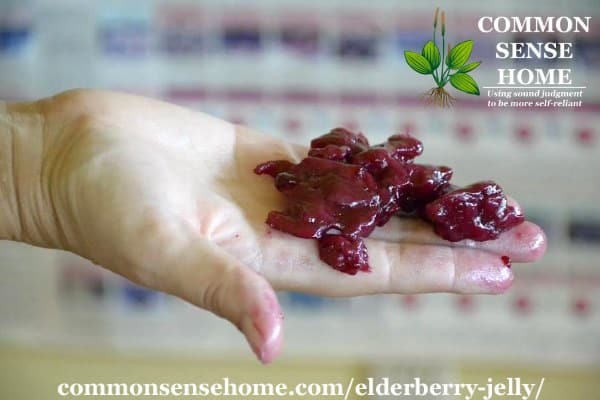 In a large, non-reactive pot, combine elderberry juice, lime juice and the calcium water. Bring to a full boil. Ladle hot jelly into sterilized jars leaving 1/4″ headspace. Wipe rims clean and screw on the lids. Process for 10 minutes in water bath canner (add 1 minute for every 1,000 feet above sea level). Makes around 4 cups of jelly. We had a little incident while making this jelly. I forgot to mix the pectin into the honey before dumping it into the hot juice, and tried to add the pectin separately. This is what resulted. There was no way that pectin was going to dissolve properly, so we fished it out, and I mixed another 4 teaspoons with 1/4 cup sugar, and mixed that into the hot liquid while stirring briskly. It worked like a charm and the jelly was saved. 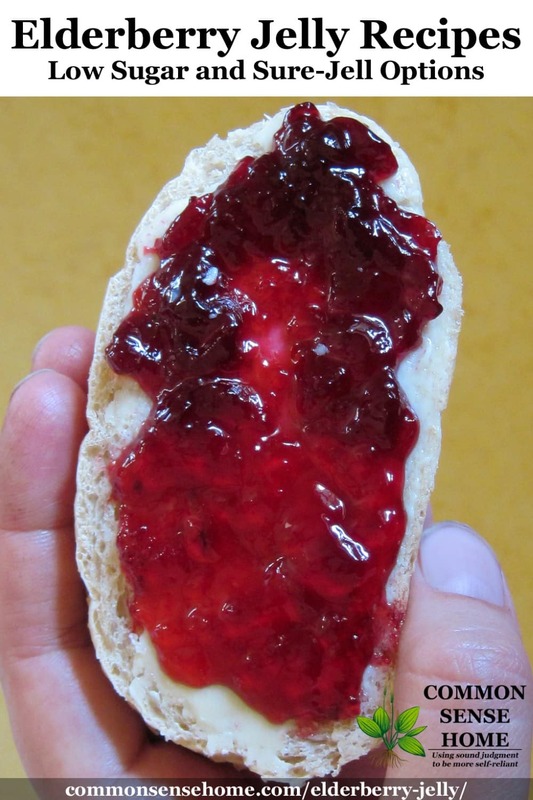 This recipe was based on the instructions for blackberry jelly included with Sure-Jell pectin. Sterilize 5-6 8-ounce jars, keep hot. Heat lids and rings in hot water, keep warm but not boiling. Fill water bath canner and bring to boil. Stir pectin into juice in saucepot. Add butter to reduce foaming. Bring mixture to full rolling boil (boil that doesn't stop bubbling when stirred) on high heat, stirring constantly. Stir in sugar. Return to full rolling boil and boil 1 min., stirring constantly. Remove from heat. Ladle into prepared jars, filling to within 1/8 inch of tops. Wipe jar rims and threads. Cover with two-piece lids. Screw bands tightly. Place jars on elevated rack in canner. Lower rack into canner. (Water must cover jars by 1 to 2 inches. Add boiling water, if necessary.) Cover; bring water to gentle boil. Process 5 min. Remove jars and place upright on towel to cool completely. After jars cool, check seals by pressing middles of lids with finger. (If lids spring back, lids are not sealed and refrigeration is necessary.) Makes 5-6 eight ounce jars of jelly. After a busy day, we ended up with a nice assortment of syrups and jellies for our families. 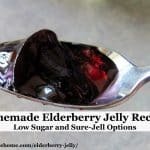 Lightly sweetened with a bit of lime juice for acidity, this elderberry jelly is sure to please. Calcium water is mixed up from a calcium powder that is included in the box of Pomona's Universal Pectin. This old fashioned elderberry is a full sugar recipe thickened with Sure-Jell pectin. 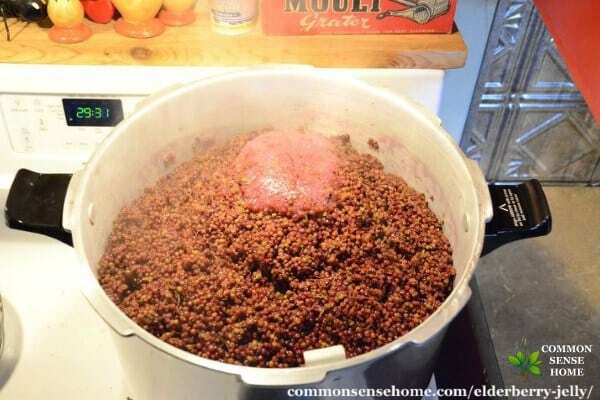 My friend, Tami, saw my comment on the Common Sense Home Facebook page about wanting to experiment with elderberries, and embraced the challenge with gusto. She and her family went picking, and came home with the entire car trunk filled with elderberries. Bless her heart, I didn't have time to help her process them the next day, so she stuck them in the freezer overnight and tackled them herself. Yes, those are FIVE GALLON BUCKETS – full of elderberries, plus the two boxes. It was a very, very long day. Tami said that she found the fastest way to strip the berries from the stems was using a large comb (washed before using – honest!). Why do you need to remove elderberries from the stems before juicing? Stems, bark, leaves, and roots contain a cyanide-producing glycoside. While these parts can be used medicinally, it's best to keep them separate from the berries, especially in an application that might end up concentrating the problematic substances. Once the elderberries were removed from the stem, Tami cooked them down in a large pot and then stuffed them into a pillowcase, which she hung from under a stairway. You know that pillowcase is never going to be non-purple again. There was a smidgen of fallout, too. With so many elderberries, juice ended up everywhere, even on the toilet seat in the bathroom. I feel so honored to have a friend that's willing to completely trash her house for me. 😉 Big hugs and kisses, much love. When all was said and done, it was after midnight and 24 quarts of juice had been processed in the water bath canner. Quarts are processed for 10 minutes, pints and cups for 5 minutes. 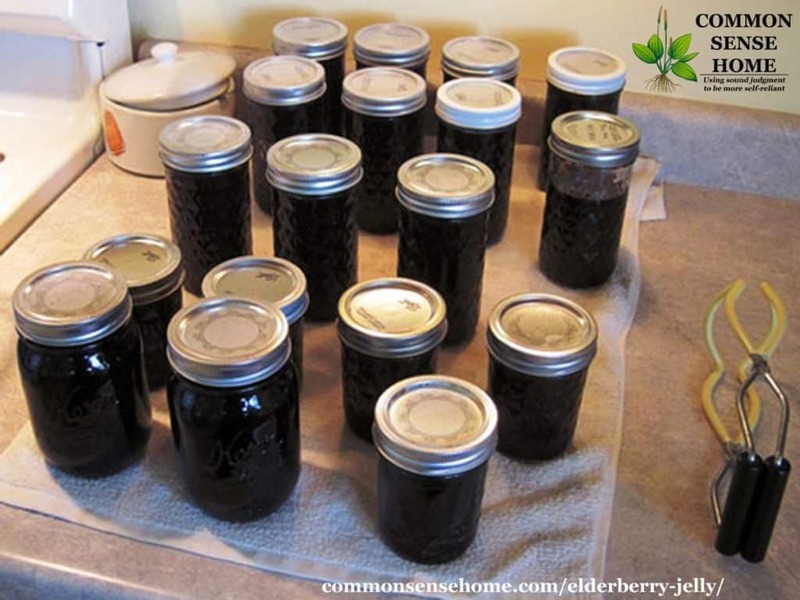 For more detailed instructions on water bath canning elderberry juice, visit pickyourown.org. I haven’t made any jams of jellies for a long while, must start up again. Crab Apple jelly is one of my faves. Still, I do a lot of fermenting, kimch, sauerkraut, Kombucha etc. Do you make any of those? PS, Blackberries looking pretty abundant round here, how about where you are? I haven’t found any local blackberry thickets as of yet, but am always on the lookout. 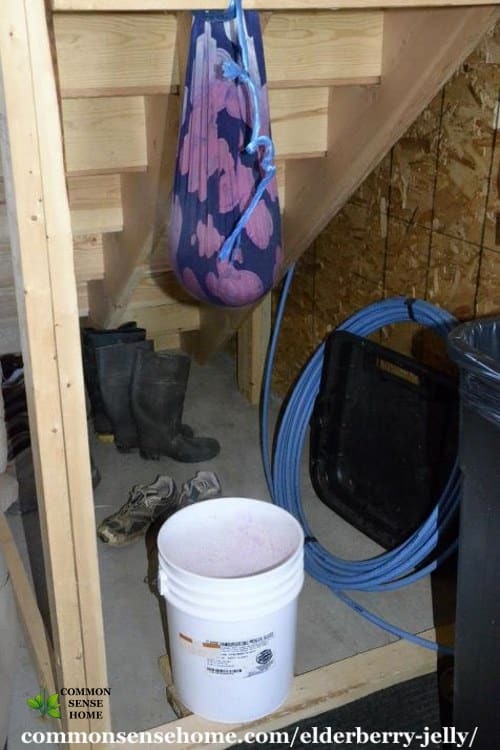 Mom used to make some lovely blackberry wine back on the farm. Elderberry jam takes a little more work, as you need to remove the seeds, so you end up with just puree instead of whole fruit. I haven’t tried elderberry freezer jam, since my freeze space goes mostly to bulk meat purchases, but I would think that the freezer jam instructions included with Pomona’s Pectin could be used for elderberry puree as well. Unable to find the recipe to make fresh elderberry cough syrup or the juice! The juice is made as demonstrated at the bottom of the post. Remove berries from stems, cook until soft, drain in flour sack towel or pillowcase. As long as they are clean, I’m sure that would work well. I am looking for a recipe for elderberries that is very similar to elderberry syrup (with elderberries, honey, ginger, cinnamon) but I am not an experienced canner. Do you know if ginger and cinnamon can be added to thr recipe when I make the elderberry juice and still canned safely? Adding a small amount of dried spices will not affect canning properties, i.e., yes, you can can safely with added spices if the food is safe to can without spices. the recipe i have includes lemon juice but i noticed yours doesnt. Why? i never thought of using a pillow case!!! will us!! You can substitute lemon for the lime if you prefer. I just like the flavor combination. The low sugar jelly needs more acid (because it has less sugar) for preservation. You can add lemon to the regular jelly, too, if you like. Calcium water is mixed up from a calcium powder that is included in the box of Pomona’s Universal Pectin. I’ve added a note in the post to clarify. It helps the recipes to gel with little to no sugar. I would like to make sugar free Elderberry jam. I would like to use honey. Can I use the sure jell pectin. Just to be clear, honey is still sugar, so if you need a truly sugar free option, for instance, for someone who is diabetic, honey will still spike their blood sugar. Honey tends to be sweeter than sugar, so when substituting in a recipe, you want to use 1/2 to 3/4 as much honey as sugar. Unfortunately, when using standard Sure Jell pectin, this is not likely to work well. Odds are that you will end up with elderberry syrup instead of jelly, or a very soft set jelly. 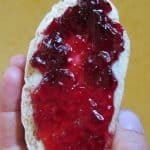 Sure jell does have a low sugar pectin that may work better, and Pomona’s Pectin can be purchased online and in many natural food groceries or departments.